There are some very special local Melbourne bookstores and games shops. and Melbourne bookshops keeping up the supply. 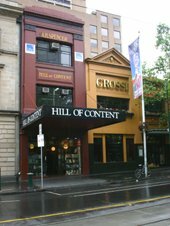 While there are the large local and international book chains, it is the intimate local bookstores that give you the special Melbourne reading experience  often combined with a coffee shop. Readings is one of the great Melbourne bookstores. It is a local business with shops in Carlton, Hawthorn, Malvern, Port Melbourne and St Kilda. It sells not just books but also music and film. Readings maintains its community ties and intimate feel with a selection reflecting the character of the area. It hosts book launches, book readings and childrens events. Here is a list of current events. The Paperback bookshop at the top of Bourke Street is a booklover treasure cove with new releases as well as hard to find and exclusive book titles. A bit further down is the Hill of Content, specialising in books of distinction, the arts, classics and poetry. Minotaur, in Elizabeth Street, is the must visit bookshop for comic fans. A games shop in Swanston Street, just down from the QV, also targets that audience. Another great shop for Melbourne games is located in the Royal Arcade. Further along in Centre Way is the Foreign Language Bookshop for other language reading. For environmental resources, there is the Friends of the Earth bookshop in Smith Street, Collingwood. For food lovers, there is Books for Cooks in Gertrude Street, Fitzroy, a specialist culinary bookstore. You will also find great independent bookshops in many of the inner city suburbs such as Prahran, Fitzroy, Carlton or Albert Park, where the rich café culture goes together with reading.